How can one evaluate whether a government labour market programme such as the Work Programme, or a subsidy to education such as the EMA is actually working? This course deals with the econometric and statistical tools that have been developed to estimate the causal impact on one or more outcomes of interest of any generic ‘treatment’ – from government programmes, policies or reforms, to the returns to education, the impact of unionism on wages, or of smoking on own and children's health. For each of these approaches, we give the basic intuition, discuss the assumptions needed for its validity, highlight the question it answers and formally show identification of the parameter of interest. The relative strengths and weaknesses of each approach are discussed in detail, drawing from example applications in the economics literature. 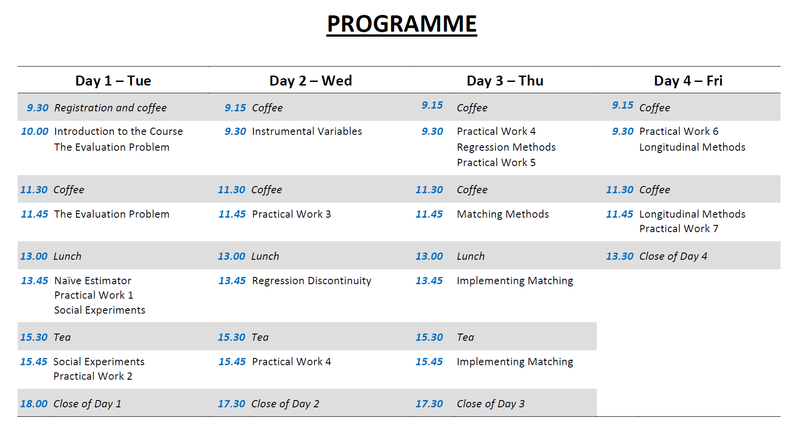 Each method will be implemented ‘hands-on’ in practical Stata sessions. use simple statistical packages (we use Stata in the course) to implement the different evaluation methods to real data. This is an intermediate-level course on quantitative empirical methods for policy evaluation. As such, familiarity with basic statistical concepts (e.g. significance testing) and basic econometric tools like OLS regression and probit/logit models is required. Note also that the course does rely on notation and there is a certain degree of formalisation (at the level of this paper). The practical part of the course will make use of Stata; although the exercises will be guided,basic familiarity with this software is strongly recommended (Please see Basic Stata PDF). In considering this course, please note that while offering an in-depth and thorough overview and discussion of the various evaluation methods, this is not an advanced course at the post-graduate level. Most emphasis is devoted to understanding the issues, to the choice of the most appropriate method for a given context and to the implementation of evaluation methods in practice. On the other hand, there is also a certain degree of formalisation, so this course might not be the most suitable to those purely interested in commissioning or managing evaluation work. Note also that while participants have often come from a range of backgrounds and have reported enjoying the course, the examples and discussions come from a mostly (labour) economics perspective. No preparatory reading is required as the course does not assume prior knowledge of evaluation methods and issues. Blundell, R., Dearden, L. and Sianesi, B. (2005), “Evaluating the Effect of Education: Models, Methods and Results from the National Child Development Survey”, Journal of the Royal Statistical Society, Series A, 168, 473-512. IFS Working Paper.